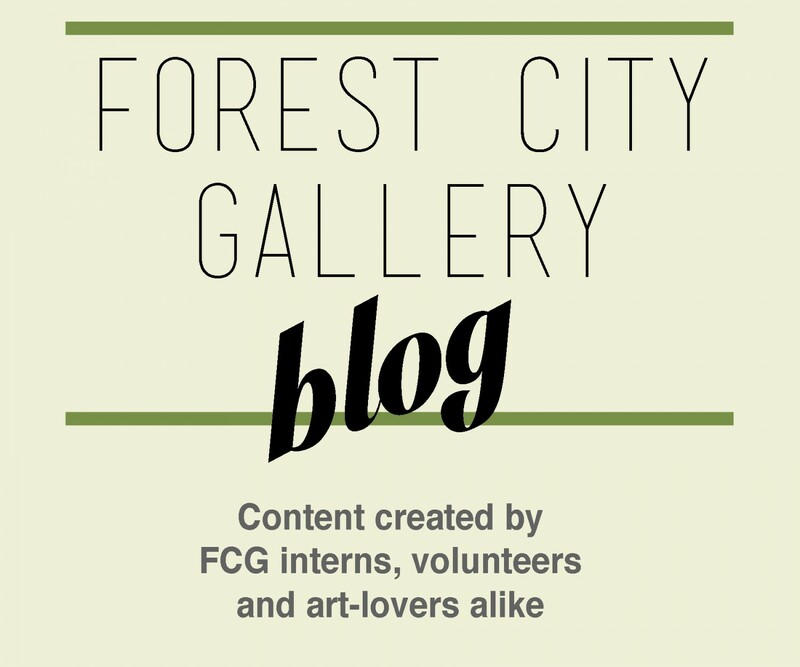 Earlier this month, Forest City Gallery Blogger and Intern, Lucas Cabral, investigated FCG’s current exhibition Tuck by D’Arcy Wilson. Below, Lucas offers some observations about this exhibition that intertwines textiles, technology and taxidermy. Forest City Gallery hosts Tuck, an exhibition by Nova Scotia based artist D’Arcy Wilson. Wilson is an interdisciplinary artist whose work investigates the relationship between humans and undomesticated animals and the separation of humans from their natural world. 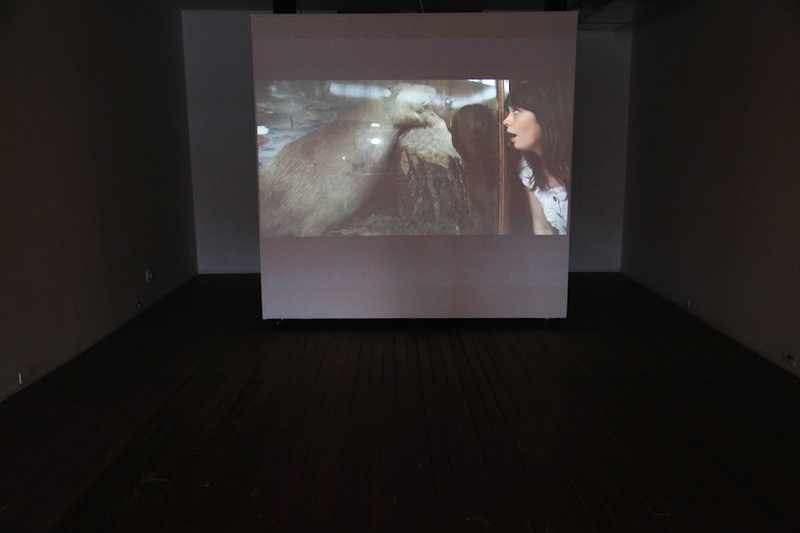 The show is made up of two of Wilson’s projects: Tuck (2011) and Fleshold (2010-2014). 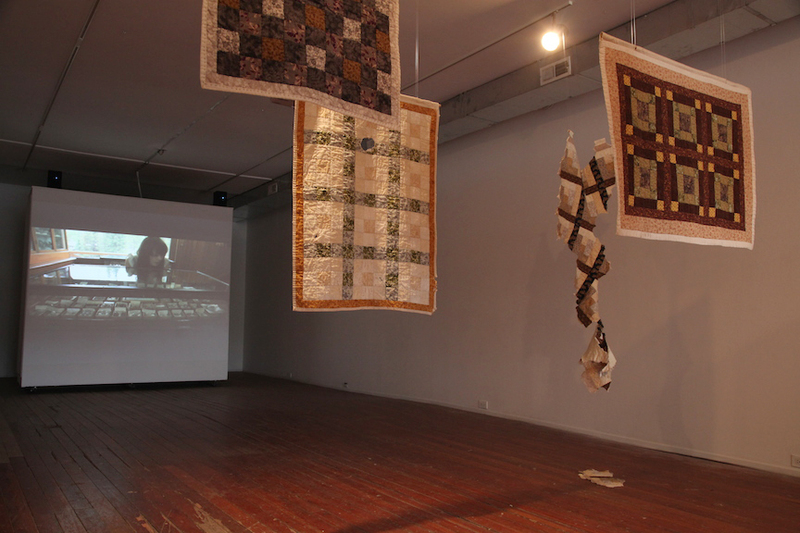 Fleshold occupies the front half of the gallery and pairs a two-channel video with a number of the artist’s hand-made quilts, each distressed in its own way. The left channel of the video shows the making of the quilts; the intimate shot shows only the artist’s working hands. The right channel shows animals reacting to and acting with the completed quilts. 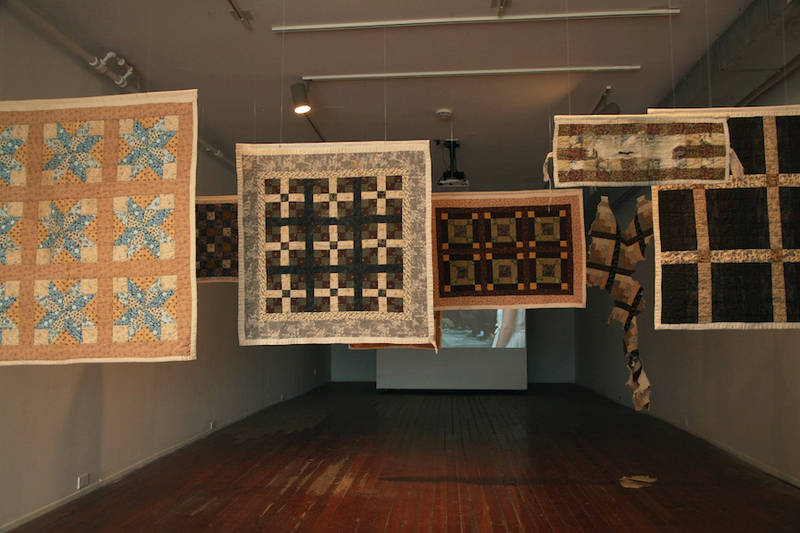 In process, the artist made each quilt with the specific animal in mind, selecting suitable and appropriate materials based on information collected through her research. The quilts were then given to animals staying in rehabilitation centers. Having seen the video before entering the maze of suspended quilts, the viewer is able to inspect the quilts for material clues and damages, looking to make connections between the state of the quilt and the animal that received the gift. Examination and postulation reveals much about the human understanding of animals and its validity. A particularly ravished quilt, previously belonging to a coyote, satisfies the viewer’sthoughts on the animal, similarly to a quilt which remains in good state having previously belonging to a group of deer. Other quilts, such as the one that lined the cage of a few small birds, have quite deliberate rips that one might not expect. Weaving through the quilts that are quite close in proximity, the viewer is able to contemplate the behaviours of each animal, the understandings we possess of the animals, and the origins of such thoughts. Each quilt, with its rips and marks, provides a tableau of the relationship between the animal and humans as the artist attempts to mend it. Having worked through the quilts, the viewer arrives at Tuck, which in the space is seen as a large video projection. The video follows the artist through the Banff Park Museum National Historic Site as she sings lullabies she has composed for each of the taxidermied animals. Closing the lights as she leaves each space, the artist attempts to provide rest for the seemingly awake yet unresponsive animals. In her attempts to get to know the animals and make amends for their state, Wilson hopes to shorten the distance between her and nature. The taxidermy being obviously unresponsive marks the futile efforts on the part of humans to fully understand these animals or make restitution for our treatment of valuable, rural ecosystems. The inability to successfully communicate further demonstrates the separation felt by the artist to nature.